It’s approaching peak season for flights, as millions of people take their summer holidays. How can the aerospace industry best be encouraged to improve fuel efficiency, reduce emissions and cut noise? 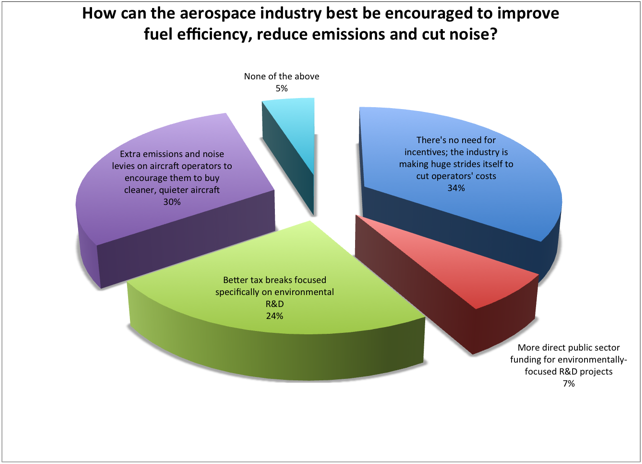 Opinion was narrowly divided by last week’s poll, which asked how the aerospace industry could best improve the efficiency, emissions output and noise levels from its winged products. Of 338 respondents, 34 per cent thought that the industry is making huge strides to cut operators costs, followed narrowly by 30 per cent who thought extra emissions and noise levies on aircraft operators would encourage them to buy cleaner, quieter aircraft. Just under a quarter of respondents (24 per cent) thought better tax breaks focused on environmental research and development would lead to improvements, and seven per cent thought environmental R&D funding should come directly from the public sector. Five per cent of respondents were not satisfied with the options presented to them. On the manufacturing side, Airbus alone says it is spending over 90 per cent of its research and technology investments on eco-efficiency, and the A350 XWB alone will burn 25 per cent less fuel compared to previous generation aircraft. From an operational perspective, expected outcomes from the Single European Sky ATM Research (SESAR) project include a 10 per cent reduction in the effects flight have on the environment, and a three-fold increase in capacity which will reduce delays on the ground and in the air. Stop providing a massive subsidy for their pollution by starting to tax their fuel and make them fund their own infrastructure. Start taxing aircraft fuel like it’s done with cars and trains. Put equivalent tax on avtur as avgas and encourage people to holiday without flying to reduce pollution and annoyance. ‘Encourage’ by making Eurostar, thalys, TGV, etc., as cheap as flight. Air resistance is a major factor in increasing fuel consumption in Jet aircraft. This, along with a significant portion of any flight being spent boarding and taxiing then maybe we should use modern technology to design a plane that flies more slowly but with much greater economy. Some of us are quite happy to spend an extra hour or so in flight if it uses say 50% less fuel. The aim should be to get more money into research. You need to ensure that airlines/manufacturers who spend on research are not at a competitive disadvantage against those who don’t – otherwise they won’t spend. Like cars, plan for a zero emission future and start bringing in standards that force airlines and manufacturers to spend a bit more on the really far out technologies that otherwise would be considered too risky. Tax is stupid – the money goes to central governments to finance whatever stay-in-power schemes they currently have and doesn’t get spent on science or engineering that helps humanity in general. Tax is NOT stupid. Effectively reducing the subsidy on flying will put the price up, reducing air traffic and therefore pollution until the whole industry takes their environmental responsibilities seriously and does something about the problem, which they are currently not doing in any meaningful way. Lower pollution per passenger mile would mean lower costs and more business. It is a blunt instrument, but the only way to get them out of the subsidised fantasy world they live in. Tim M – A zero emission future. So we must breed cows that don’t fart, or humans for that matter. Methane is the biggest contributor to so-called global warming. And your comment about cars becoming zero emission seems impracticable at best. It may be that reducing the Global population to a thinly spread few million people may be your only solution for zero emissions. Electric wheel motors for taxing could reduce ground fuel burn, powered from APU. But forget the rather odd kinetic energy recovery landing systemproposed a few years ago! How about this for a “far out technology” suggestion. The recent publicity generated by a demonstration flight of a large wingspan single seat plane with PV panels on the wings and electric propulsion motors started me thinking. With developments such as graphene in mind opening up the possibility for very strong, lightweight, flexible solar panels would it not be possible to have very large surface area, highly flexible, very thin solar panels that could be deployed and trailed behind an aircraft when at altitude? At cruising altitude the air is thin so air resistance would be lower and above the clouds the sun is always shining and presumably more intense. If such a system could be developed then the reduced fuel load required on long haul flights would allow for on board batteries for electric powered take off and landings which would certainly improve fuel efficiency, reduce emissions and cut noise. I appreciate that flights would need to be scheduled for long haul travel in daylight but is that such a problem? For short haul flights perhaps improved rapid low carbon ground transport systems such as the proposes evacuated tube between San Francisco and Los Angeles will be a part of the answer. Touching on the zero emission electric vehicle comments above, once the world moves to producing electricity for mining, manufacturing and transport as well as for domestic use from solar, nuclear in the interim and other low carbon renewable energy sources then truly zero emission electric vehicles will certainly be possible. In the meantime it is still very worthwhile for health reasons alone to move away from powering vehicles with fuels that emit harmful levels of particulates and products of hydrocarbon combustion in highly populated city centres and along major traffic corridors. Future generations will look back and wonder how pollution on this scale was knowingly permitted in much the same way that we (all?) wonder today how anti-knock lead in petrol was permitted for so many years until push came to shove and chemical and mechanical engineering solutions found ways of solving the anti-knock problem without the need for tetra-ethyl lead additives. Steve. A concept for just this idea was put forward a while ago to reduce the amount of fuel used taxiing. Unfortunately the power required to move a few hundred tons of fully laden aircraft fast enough meant the electric motors and batteries weighed so much it more than countered any fuel saving so was, for the meanwhile, abandoned. Try moving duty free to end of flight and no duty free on board? how much weight would that take out of the air? John – Agreed. I recall Margaret Thatcher, being a chemist, understood this and was wholly against the use of Catalytic converters rather than developing lean burn. A ‘cat’ takes some miles to fully heat to operating temperature, during which time it is both dirty and thirsty. For the myriad of short journeys that comprise most of the UK car trips, this is not effective or ‘green’. Maybe there is a furture for an airship with its very large surface area and with developments in polymer semiconductors could combine the two to advantage. My recent experience with trying to power a laptop from solar cells shows that average figures for power output are very much lower than peak values unfortunately. Although probably feasible now, or in the near future I’m not sure that this would ever be a really practical form of transport. The aerospace industry and commerce with allied insurance companies MUST also develop ways and means of locating where planes are 24/7 internationally at sea, on sea-bed, on land, and in the air. Something similar to the SAT-NAV in my car! I want to establish an on-line forum similar to the above here but participants must firstly register and pay to take part. Please most kindly advise me.